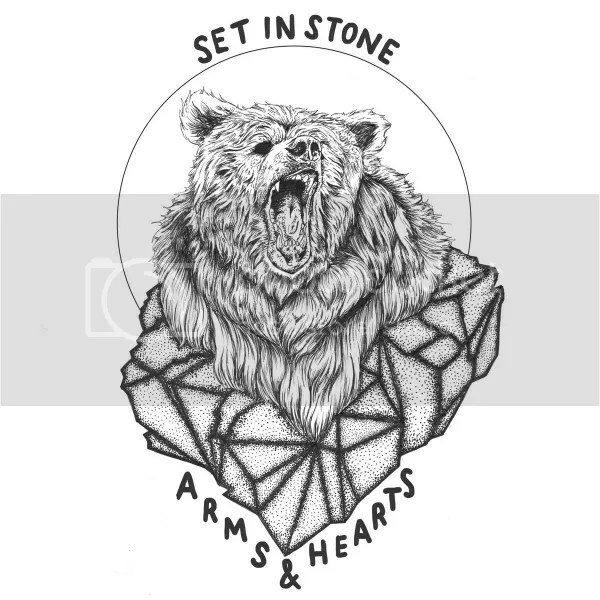 Set in Stone by Arms & Hearts isn’t the most original EP you’ll listen to this week. It wears its influences on a heavily tattooed sleeve, one that’s stained with beer and cigarette smoke and the dust of the open road. It’s punky Americana, wistful and achingly broken when it’s at its best, but a little too comfortably familiar when it’s at its worst. Slide guitars crawl, harmonicas whisper, the whisky trickles out of the words and puddles up into a collection of songs that starts slightly weakly but ends with some of the best heartfelt folk you’ll have heard for a while. There are shades of Sad and French, Uncle Tupelo, and a whole swathe of swamp-coloured troubadours with checked shirts, hefty beards, and guitars covered in stickers. The first track, ‘I, Malcontent’, is the least striking on the EP. It’s a little cheerier, a little more sing-a-long, a little more twee, and doesn’t fizz with the same honesty as the three that follow. Set in Stone is at its best when it’s rolling in melancholy. Tracks two and three, ‘The Rain’ and ‘Dust and Bones’, bubble with thwarted wanderlust. With fear, loneliness and that feeling you get when you’re sat on a bench, drunk off your face at around four in the morning and you really you wish you had someone to sing with. There are cracks in Steve Millar’s voice, and they open up glimpses into something raw and red at the heart of both of the songs. But it’s with ‘Take No Prisoners’, the final song, that things really come to life. It might still be a song for staring at wet street corners with wistful eyes, but it’s beautifully done, mixing anger and hope into a sound that’s almost impossible not to sing along with. There’s a sloping stomp, a rhythm that pushes the song into its final rousing chorus. And then it’s done. And you can’t help but want a bit more. Set in Stone might not be original, but it’s a passionate EP, and it’s sung from the bottom of the heart as much as it is from addled lungs. If you’re a fan of the slower moments of The Gaslight Anthem or The Loved Ones, or you’ve ever swooned over Chuck Ragan, it’s well worth checking out. This entry was posted in Reviews and tagged acoustic, acoustic punk, arms & hearts, arms and hearts, chuck ragan, ep, folk punk, gaslight anthem, loved ones, review, set in stone. Bookmark the permalink.